Microsoft Dynamics 365 Business Central is a cloud-based business management solution that’s designed to give you an “end-to-end” control of and visibility into your business. It comes in two versions: Premium and Essentials. This article compares the two options. What is Microsoft Dynamics 365 Business Central? Dynamics 365 Business Central is an easy-to-use, browser-based, all-in-one business management solution. It provides financial management functionality as well as a variety of business management features. These include compliance, supply chain management, security and sales-growth drivers like built-in buy recommendations for customers. Users can take advantage of management tools for budgets, manufacturing and warehouse operations. Dynamics 365 Business Central Essentials is the base offering, but it contains an impressive collection of features. Its financial management capabilities comprise basic general ledger, budgets, deferrals, basic fixed assets, bank reconciliation, bank account management, audit trails and multiple currency compatibility. With Essentials, is it possible set up a company and start posting to the general ledger, setting up a chart of accounts, general journals, recurring journals and VAT facilities in the process. Budgets work inside the general ledger. You can keep track of fixed assets, with the ability to do depreciations, write-downs and so forth. The Customer Resource Management (CRM) tools in Essentials let you keep an overview of your contacts, organize campaigns by customer segment and manage sales opportunities. You can integrate Essentials with Dynamics 365 for Sales, too. This enables you to create estimates, synchronize your sales order data, product available and so forth. You can manage sales orders along with purchase orders and receivables. Inventory management includes multi-site capabilities. This way, it’s possible to manage inventory across plants, distribution centers, retail outlets and delivery vehicles. You can even manage inventory at the bin level in a basic warehousing function. Human Resources (HR) features in Essentials span the tracking of employee information and the organizing of employee data by factors like experience, skills, training, union membership and so forth. Essentials provides expense and project management tools. You can set up and manage time sheets as well. What’s Different about Dynamics 365 Business Central Premium Edition? The Premium edition has everything in Essentials along with an assortment of more sophisticated features. Service Management is one area of difference, for example. With Premium, you can register services that take place after a sale, e.g. installing tires after selling them. Service price management is part of this feature set, as is the ability to record and keep track of all service items like contract specifications, component management warranty information and so on. Service contract management lets you keep track of service levels, parts and labor, response times, service histories and discount levels. With Dynamics 365 Business Central Premium edition, you can also plan and track the execution of planned projects, e.g. assign employees to take care of orders and record details about work status. You can manage dispatching, too. Premium edition enables you to oversee service personnel and technician in the field. Conduct “agile manufacturing,” planning rush times, create exceptions to process, etc. Integrated Business Group offers both the Essentials and Premium versions of Dynamics 365 Business Central. We can help you decide which edition is right for your business and, from there, provide the implementation services you need to get it running right. For more information on our Dynamics 365 Business Central services, visit https://www.integratedbusinessgroup.com/microsoft-dynamics-365-business-central/. Whether you are a current Dynamics 365 Business Central user or looking to see what’s new in the platform on your journey to familiar and functional small business ERP, we are excited to share with you some of the enhancements introduced in the April 2019 release of the application. In our last blog on the topic, we discussed how Dynamics 365 is changing the way companies receive updates, resulting in something we call “evergreen ERP.” Rather than seemingly random updates and limited support schedules, Dynamics 365 remains new no matter how long you use it. As Microsoft has made changes to the update schedule, the company has officially moved to twice-yearly releases in April and September. Business users in need of productivity have received a wide range of improvements, ranging from application enhancements to easier search and navigation, more keyboard shortcuts, and more. Longer Names and Descriptions: You can now enter up to 100 characters in all Descriptionand Name fields across Business Central. Better Structure for Inventory Counting: The Physical Inventory Orderand Physical Inventory Recording pages increase productivity and address gaps in the existing functionality. Add Multiple Items to a Sales or Purchase Document: You can now select multiple items at once from the items list to add to sales or purchase documents. On any sales or purchase document, choose the Select Itemsline action. Sales Quote Validity Policy: You can now set date formula in the Quote Validity Calculationfield on the Sales & Receivables Setup page that will be used to calculate the Quote Valid Until Date field on sales quotes. Skip Prompt to Create Item: When you enter an item that does not exist on a document line, you are prompted to either create a new item card or select an existing item. In some cases, such as when importing many new items, this prompt blocks the process. You now have the option to skip the prompt. Copy Customer Dimensions to Jobs Created for Customer: When a job is created and a customer is assigned to the job, default dimension values from the customer are copied to the job. Customer, Vendor, and Item Templates: You can now copy existing data templates when you create new ones. Merge Duplicate Customers, Vendors, Contacts: When a duplicate customer, vendor, or contact record is created by mistake, you can now merge such duplicate records to a single record, given that you have the MERGE DUPLICATES permission set. SWIFT Code Lookup: You can now keep a list of SWIFT codes for banks that you work with and use it on pages where you use bank accounts. Ensure Approval Users are Set Up to Run Approval Workflows: A check is added to ensure that the user is set up on the Approval Userspage before they can initiate an approval workflow. Schedule Background Jobs Using a Date Formula: You can now schedule background jobs or reports by defining a date formula, meaning a relative date, instead of defining a fixed day. Set Default Ship to Address: Customers can have multiple addresses but they usually have a central warehouse that goods must be shipped to. You can now define a customer’s default ship-to address in the Ship-to Codefield on the customer card. Change Descriptions on G/L Entries: If you entered the wrong description during posting or if you just need to change a description on an earlier G/L entry, you can now edit the Descriptionfield on the General Ledger Entries page to overwrite the original posting description. There are a wide range of additional enhancements and features in the April 2019 update, all of which you can view here. Developers have a new, simple and intuitive model to build custom list views in Visual Studio Code for the modern clients. Not only does it empower developers to create alternate views of a list with each their own custom column layout, but the new views also overcome most of the shortcomings with the earlier model. Accelerate repetitive entry of records with the powerful Quick Entry feature for the desktop browser and Windows desktop app. Quick Entry is a powerful and simple feature that provides an alternate path through editable fields on a page. It changes the behavior of the Enter key to be different from the Tab key, moving the focus to the next Quick Entry field across the page and skipping over non-essential fields. Finding the features in the product easily is essential for all users. So is getting an overview of what’s in the product. For the April ’19 update, Microsoft is making it easier to find functionality by providing a full overview of features in the product based on the content of RoleCenters. This makes it much easier for our customers to navigate and find the right features in the product while also giving an overview of RoleCenters and their content. As a supplement to using the current RoleCenters navigation bar, the command bar, or Tell-Me searches, this new overview brings the actions or modules you need and use closer to you so that you can stay focused and productive. In addition to the improvements for business users, administrators gained a few enhancements ranging from increased customization to lifecycle management improvements. Business Central and D365 for Sales Integration Improvement: As an increasing number of Business Central users use Dynamics 365 for Sales, the Business Central integration with Dynamics 365 for Sales has to deliver reliable synchronization, improved sales order integration, and shared AI insights with Dynamics 365 for Sales. See more here. Organizational Theme: Office 365 administrators can now change the default theme of the header by specifying a company logo and background color that match company brand. Application Lifecycle Management Enhancements: A major improvement in the April 19 release, BC admins get a lot more flexibility, ability to preview and test, take advantage of extension management and more. See what’s new here. Enhancements to the Intelligent Cloud: The Intelligent cloud offers across the board enhancements for a wide range of Dynamics applications. View these improvements here. Find the information you need faster and more easily with a range of self-help and support enhancements in Dynamics 365 Business Central. Simplified Help and Support Experience: Users will now find links to self-help content and documentation, commonly requested troubleshooting information to self-diagnose or hand over to Support, seek advice from the community, or post new ideas. Administrators can configure a single support email address for the customer’s organization that allows any user to contact their IT administrator or supporting partner to receive support. Page Inspection: Troubleshooting errors in business data or feature configuration often requires an additional level of insight beyond what is shown on the page. Power users and support staff can now inspect any page (or the page parts within a page), revealing the entire contents of the current record including fields that are not shown on the page. See more about each of these features here. In addition to the wide range of enhancements, developers have new features available to them. Designer Enhancements: The Designer accompanies Visual Studio Code and is a convenient way for developers to test and rapidly adjust visual content on page objects. Developers have access to a range of tools including Designing Actions, Quick Entry, field importance, list views, and the navigation bar. See the entire list of improvements here. Visual Studio Code and AL: The April ’19 release focuses on preparing to move the base application and country modifications from C/AL to AL, on optimizations for working with large projects (such as the base app on AL), as well as on additional productivity features addressing feedback from internal and external developers. Standard Web API No Longer in Beta: The standard web API is moving out of beta. The API has been in beta while evolving based on feedback from the partner community. This release integrates final improvements and several new entities in the API as version 1.0. As mentioned above, Microsoft releases Business Central on a twice-yearly update schedule—April and October. These backward compatible updates ensure you are always on the latest version of the Dynamics 365 Business Central platform without breaking an integration or undoing a customization. Learn more about Dynamics 365 Business Central and contact us for a free consultation. Microsoft Dynamics 365 Business Central is a powerful yet familiar ERP solution for small and medium businesses. Leveraging the cloud to provide increased accessibility, innovation, and ease of use, the platform is transforming the way companies like yours do business. However, there is another benefit for Business Central users—evergreen ERP. What is it and why does it matter? Read on to learn more. When Microsoft Announced Dynamics 365 Business Central, the goal was to deliver the innovations small and midsized business customers needed from a cloud application while providing the familiar interface of a Microsoft Dynamics product. While the update schedules have changed, and the name has been updated a few times to clear up confusion for customers, Microsoft has continued to add new features and enhancements designed to provide users with the latest and greatest the company has to offer. When you move to the cloud, you trade in the server racks and electric bills for a much more user-friendly pricing model. You also receive another key benefit, the last, best version of the software. In the legacy ERP world, updates were a hassle. Not only were updates rare—often coming out once every couple years, once the product was released, the support clock started ticking. For Microsoft, five years after the product was released, it entered extended support and after ten, the only changes made were critical security updates. Not only was the rollout of an update challenging for businesses, too often, an improvement would cause more headaches than it was worth. Integrations would falter, customizations would disappear, and too often, the IT staff had to spend time making repairs to the old way in the event you wanted to add something new. Even if they were on the same product, businesses were frequently on different variations. Some would have the latest patch, others didn’t. Ultimately, this created problems not only for the customers, but for Microsoft. Luckily the move to create a cloud application changed that. Now, updates are automatic, easy, happen during off-peak hours, and most importantly, don’t result in undue burdens for customers. Designed to add enhancements faster, more easily, and at a lower cost to customers, Dynamics 365 Business Central customers who needed predictable updates with continuous deployment can leave the office one day and walk in to see the improved software the next. One of the key selling points of the cloud, Business Central was one of Microsoft’s first applications to embrace the Modern Lifecycle Policy, with the change to just recently being announced for Finance and Operations, Microsoft’s enterprise cloud ERP. So why does this matter for customers? First, alongside this schedule, changes are announced well in advance, giving customers time to understand the enhancements being made and play around with the new features and validate major changes in a sandbox environment before the release. This allows users the ability to assess productivity and efficiency gains of the new capabilities, as well as train end users about new capabilities. Second, it adds predictability. Rather than releasing big updates some months and small updates other months, the twice-yearly update schedule makes it easier for staff to prepare for changes. ZDNet: Microsoft Dynamics 365 April 19 Update: What’s New? As we enter 2019, the competitive landscape will continue to heat up, consumer expectations will continue to rise, and your business will need to adapt to the evolving challenges that present themselves to you. However, if you haven’t taken steps to prepare yourself for the year ahead, you may not be able to keep up. Many businesses know the feeling. “Yes, closing the month was a challenge, but we just can’t afford to make a change right now,” or “implementing software seems like more of a hassle than it’s worth,” delaying the decision until another quarter, another year, or altogether could cause more damage to your business than cost savings. Too often, growing businesses attempt to push their technology past its expiration date or beyond its capabilities, often with unintended consequences. Whether it’s in the form of increased stress placed on back office workers, a lack of visibility into costs or opportunities, or inability to deliver to your customers, continued use of an outdated business management software could hurt your reputation, sales, and relationships. This creates a new challenge—one that is only exacerbated by growth. If you’re feeling the pain now, imagine how bad it may be if your business is 10%, 20% or 100% bigger. Worse yet, as you grow, customers expect more from your business, not less. In the era of instant gratification, free two-day delivery, and information at their fingertips, your customers expect you to deliver. We waste too much time dealing with multiple systems that can’t talk to each other. Manual processes are error prone and can’t keep up with increasing demand despite added headcount. Creating and configuring reports it too complicated, and often doesn’t give us the information we need. Incomplete or incorrect information creates customer dissatisfaction and lost sales. Increasingly stringent compliance and security concerns keep you up at night. Productivity is lost spending valuable time switching back and forth between multiple applications and disconnected systems. If so, you may be pushing or exceeding the limits of your undersized or outdated accounting software. If growth—or even stability—is a priority in 2019, continuing to rely on these solutions is going to cause more pain to your team than necessary. Longer hours for workers trying to overcome the software limitations; inaccuracies that could lead to audits; lack of visibility that could harm your decision making, and so much more—you may find that your solution isn’t solving anything. Improved and increased productivity with easy-to-create workflows, quotes, orders, and audit trails using the same Microsoft Office tools you’re familiar with. Consistent experiences across mobile devices regardless of location, complete with enterprise-class security. The ability to spot trends and delight customers through centralized, business-wide, up-to-date data. A fast, intuitive platform to get you started right away. Recognizing your current system’s limitations is the first step to making a decision that could change the trajectory of your business now and in the future. At Integrated Business Group, we work with companies like yours to discuss challenges and opportunities for improvement that can set your business for success in 2019 and beyond. We invite you to read a guide for replacing accounting software, learn more about our work implementing and supporting Microsoft Dynamics 365 Business Central, and contact us for more information. What’s on the horizon for businesses in 2019? More change. From finding and supporting new customers to dealing with new technology and data challenges, the coming year will require businesses to take a different look at the way that they operate, leveraging technology to get there. 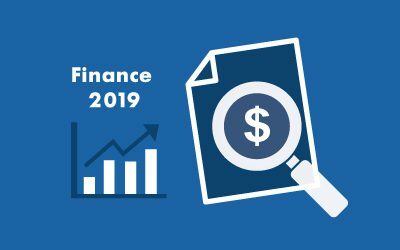 A recent Microsoft report looked at the challenges, opportunities, and risks that finance will face in the rapidly approaching year. This report looks at six key trends that businesses will need to look into in 2019, and we will provide a brief look below. Throughout the organization, finance has continued to become more important to the entire business. No longer just tasked with managing money and approving budgets, the finance organization has found its way into operations, IT, and risk management; Microsoft found that Sixty-four percent of CFOs reported being asked to take on broader operational leadership roles beyond finance. This will require a new skillset to adjust, but technology will ultimately improve the way finance tackles these tasks. As Millennials pass Boomers as the largest generation in the U.S. and Generation Z enters the workforce in larger numbers, it also means that companies will have a broader set of customers or purchasing managers with whom they will work. Globally-minded, well informed, and passionate, they will push businesses to operate with greater transparency and create more sustainable products. Further, these customers will have different expectations in the delivery models and customer service requirements, and organizations will need to explore new ways to embrace this group of customers. Finance has continued to embrace better technology. This has presented finance leaders the opportunity to free themselves from the struggles of manual processes and the poor control or visibility, contributing more to the strategic decisions of the business. In 2019, businesses will continue to leverage more data, building a ‘culture of data.’ 2019 will mark a time when companies become smarter about how they use data, the data itself is also becoming smarter, with AI and machine learning providing instant intelligence and enabling automated processes. 2018 was a year with great uncertainty, and trends suggest that 2019 will be no different. From financial regulations, tax changes, and trade policy to Brexit and data protection, finance leaders will once again be forced to navigate through great uncertainty in a turbulent, highly-politicized environment. While Millennials and Gen Z will represent a bigger part of your customer base, they will also play a more important role within companies. As businesses face an increasing skills gap in 2019, they must seek new ways to fill critical roles, including re-training older employees, seeking foreign labor, and tapping the emerging gig economy to meet temporary labor demands. As discussed in point one, finance will be focused more on risk management. However, it goes beyond the basics of technological risk, as organizations face additional regulatory risk as well. If you are looking to continue driving your business further in 2019 and beyond, you can’t afford to be held back by manual processes and lack of visibility. Be ready with the next generation solution like Dynamics 365 Business Central or Acumatica. For more details, please contact us. Since Satya Nadella took the reins at Microsoft in 2014, he has led the company as a whole through a variety of important changes. From the important acquisitions to the new-found focus on collaboration with competitors to the concept of One Microsoft, he has also taken one of the most important steps—getting Microsoft into the cloud. Throughout 2014, Microsoft continued to make investments in and push its cloud products, backing away from per-device licenses for Windows and Office Applications while beginning its platform battle against AWS. In the years since, Microsoft continued to develop and expand the platform before the general release of “Dynamics 365” in 2016. Dynamics 365 was new, innovative, and technologically powerful. Unfortunately, it also referred to a multitude of options. At the time, Dynamics 365 could have meant Dynamics 365 (formerly CRM) or Dynamics 365 Finance and Operations, which was broken into Business (formerly “Project Madeira”) and Enterprise (Previously Dynamics AX) editions. This immediately created confusion for customers who had to try to understand the many plans that were offered, the modules that came with each plan, and the features that came with each module. While the product itself was powerful, it presented a lot of confusion during the product research and RFP stages. Luckily, in April 2018, Microsoft made the move to set the record straight, renaming Dynamics 365 Finance and Operations Business Edition and Enterprise Edition into two distinct brands—Dynamics 365 Business Central (SMB) and Dynamics 365 Finance and Operations (Enterprise). As a leading reseller and specialist in Dynamics 365 Business Central, we will be covering the product in great detail in the coming months, but today would like to take a brief look at what it is, what it does, and what switching to Business Central can do for your business. Microsoft Dynamics 365 Business Central is designed to provide a stable, affordable, and well-vetted cloud application for growing small and medium businesses. Built to provide the essentials that growing businesses need, Business Central offers two levels of its own—Business Central Essentials and Business Central Premium—that provide users powerful and reliable way to manage the entire business. Bringing the power of Dynamics NAV to the cloud, Business Central is an all-in-one business management solution that helps companies connect their financials, sales, service, and operations to streamline business processes, improve customer interactions and make better decisions. Powerful Financial Management: Break down the silos and make smarter decisions while speeding up your monthly and annual close and setting yourself up for the following time period. Smarter Supply Chain Management: Avoid stockouts and overstock with business intelligence. Business Central is designed to help you optimize inventory levels, reduce the likelihood of shortages and lost sales while maximizing profitability. Happier Customers: Get to know who your customer is and tailor your communications. Business Central features its own powerful CRM platform that integrates with Outlook as well as the financials so that you know who matters and how to reach them. Take Control of Your Projects: Not a product-based business? Business Central is there for you too. Designed to help your company keep projects on time and under budget, you can leverage the power of Power BI to analyze profitability, time use, job costs, and so much more. Control Your Operations: From forecasting to fulfilment, Business Central gives you the control over every workflow so that you can reach and maintain optimal inventory levels, run a smarter warehouse, and save money. At Integrated Business Group, we have helped companies just like yours to understand your ERP options and make the most of the move to cloud applications like Dynamics 365 Business Central and others. Get to know more about this product, our unique process that increases the likelihood of a successful implementation, and click here to schedule a demo. For the most current events & news, check out our most recent newsletter or register. 2018 Integrated Business Group | All Rights Reserved.